3/4" One Color Print Lanyard. Silk-Screen, one color, two sided printing can contain any one color logo or text design and we do not charge setup fees if we use your vector artwork. Your image will be displayed on both the front side and back side of the lanyard. Also available with a safety breakaway joint for easy adjustability. 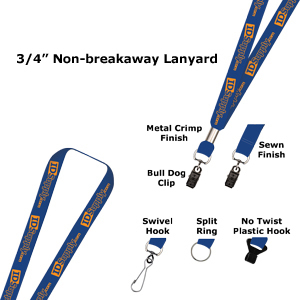 Silk-screen printed lanyards are a great way to build brand awareness at an affordable price. You can choose any text, logos or a combination of both to be printed on your silk-screen lanyard. We offer assistance with setting up your artwork to produce a great look that you will be proud of. Made of a comfortable polyester weave material, our silk-screen lanyards are available in 14 different fabric colors. With our durable silk-screen process you can choose between one or two print colors to create a professional design. If you need a Pantone matched print color, we can provide that at no additional charge. 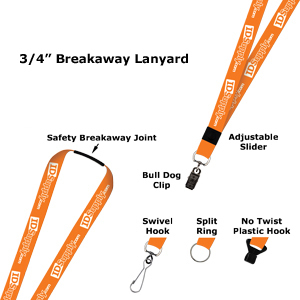 We offer an optional breakaway joint and an adjustable slider so that the lanyard can be adjusted for maximum comfort.